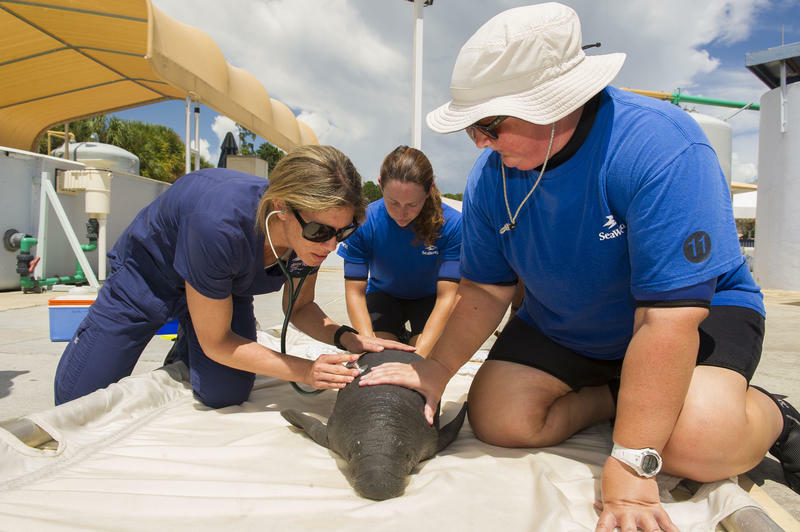 Orphaned manatee "Miles" gets a check up after being rescued. Betsy and BamBam returned to Florida this week. The Cincinnati Zoo says BamBam is being prepared for release back into the wild in early 2018. He'll be equipped with a satellite tracking device just prior to release so his health can be tracked by the U.S. 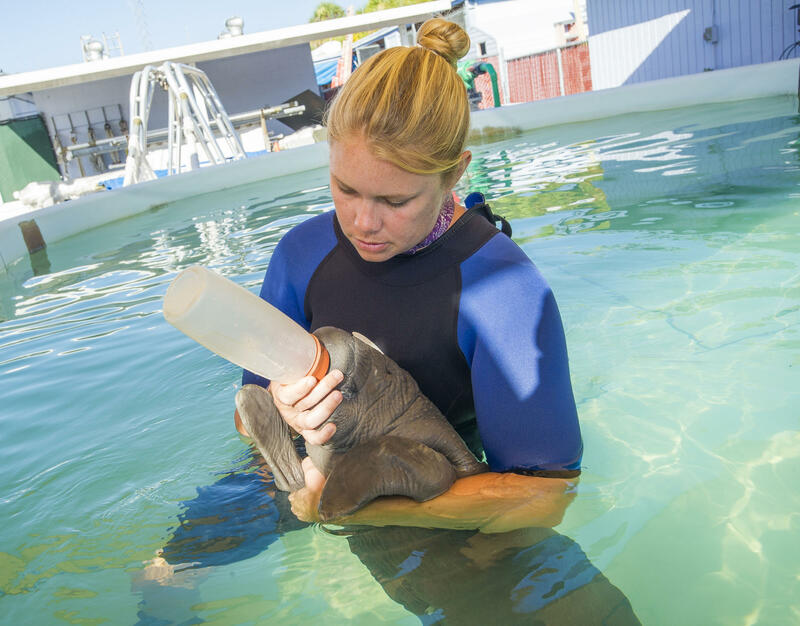 Fish and Wildlife Service's Manatee Rescue and Rehabilitation Partnership (MRP). Betsy and BamBam in 2015. Once released, the zoo says BamBam will be the 14th manatee rehabilitated in Cincinnati and returned to the wild. Betsy "is not considered a candidate for release" and will be cared for long term at Homosassa Springs Wildlife State Park. In their places, the zoo is welcoming three orphaned male manatees named Pippen, Miles and Matthew. The three require rehabilitation and come from SeaWorld Orlando. A fourth rescued orphan named Goober is being sent to the Columbus Zoo. A care giver at SeaWorld Orlando helps Pippen feed. Pippen (Male) was rescued from the Halifax River on 7/20/2016 weighing only 58 pounds. After receiving critical care at Sea World Orlando, his weight is now 225 pounds. He is the smallest manatee ever to live at Cincinnati Zoo's Manatee Springs. Miles (Male) was rescued from the Sykes Creek on Merritt Island on 8/17/2016 and weighed only 43 pounds. After receiving critical care at Sea World Orlando, his weight is now 320 pounds. Matthew (Male) was rescued from New Smyrna on 10/9/2016, right after Hurricane Matthew. He weighed 56 pounds and is now up to 340 pounds. Goober (Male - going to Columbus Zoo) was rescued on 3/16/2017 from Desoto Canal in Indian Harbor Beach Florida. His weight was 220 pounds and his is now up to 345 pounds. Pippen, Miles and Matthew will take a few days getting used to their new environment at Manatee Springs. They should be on public display by Monday, the zoo anticipates. From left: Matthew, Pippen and Miles. How Do You Move A Bunch Of Manatees? 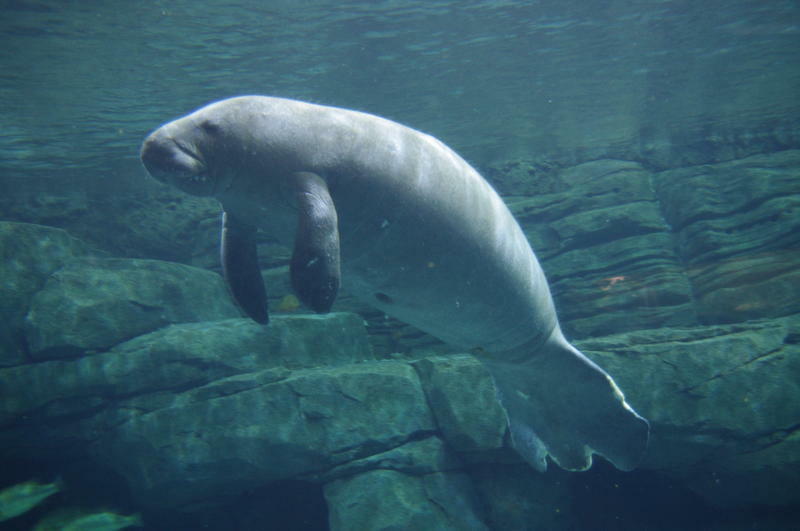 The Cincinnati Zoo calls it the "sea cow shuffle." 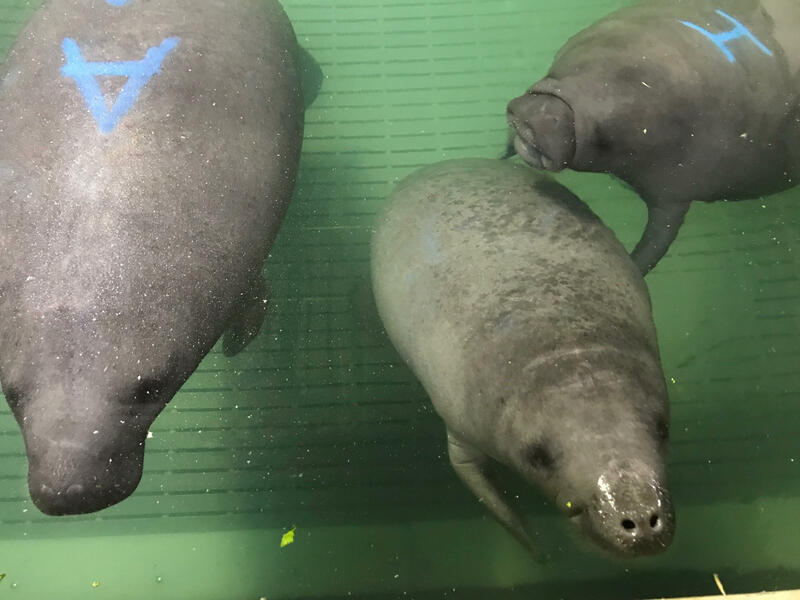 With the help of DHL, the world’s leading logistics provider, the "Sea Cow Shuffle" began at 5 a.m. on Tuesday, October 17, when Betsy and BamBam were driven to the Cincinnati/Northern Kentucky International Airport to board a flight to Florida accompanied by a manatee care specialist and a Zoo veterinarian. At each airport, the manatee crates were placed in an open-top cargo crate that was locked into the cargo hold. The manatees were kept as far away from engine noise as possible while waiting to be loaded and their crates were loaded last, so that they could be unloaded first after arriving at their destination. The same scenario happened in reverse at the other end, but the return flight included twice as many manatees. DHL flew the four small manatees to Cincinnati and the Columbus Zoo picked Goober up from the Cincinnati Zoo and drove him by truck back to their facility. 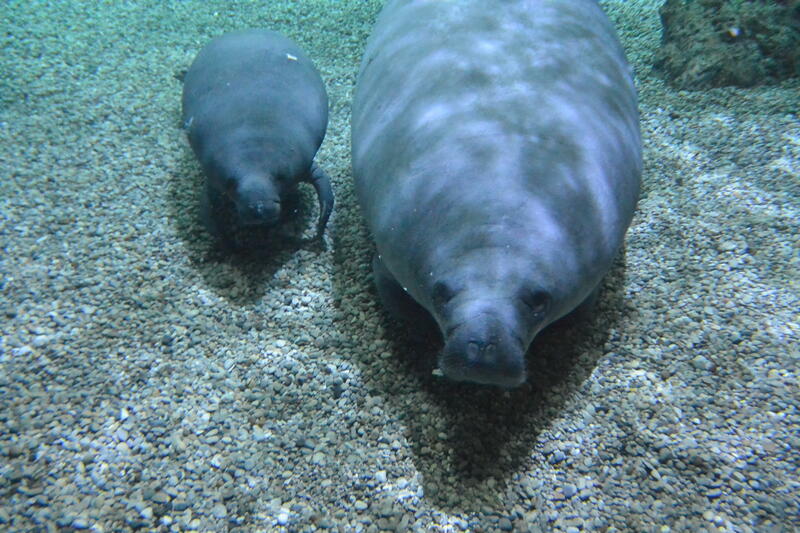 A young, female manatee named "Woodstock" is the newest addition to the Cincinnati Zoo. The 900-pound, two-year-old arrived Friday from the Columbus Zoo. Though born in the wild, Woodstock was rescued along with her mother off the Southwest coast of Florida in 2011. Both were victims of cold-stress (prolonged exposure to low temperatures), and while Woodstock survived, her mother did not. Wooten is saying goodbye to the Cincinnati Zoo. The 630-pound manatee will soon be headed to his native Florida. Next month he'll return to the wild as part of the U.S. 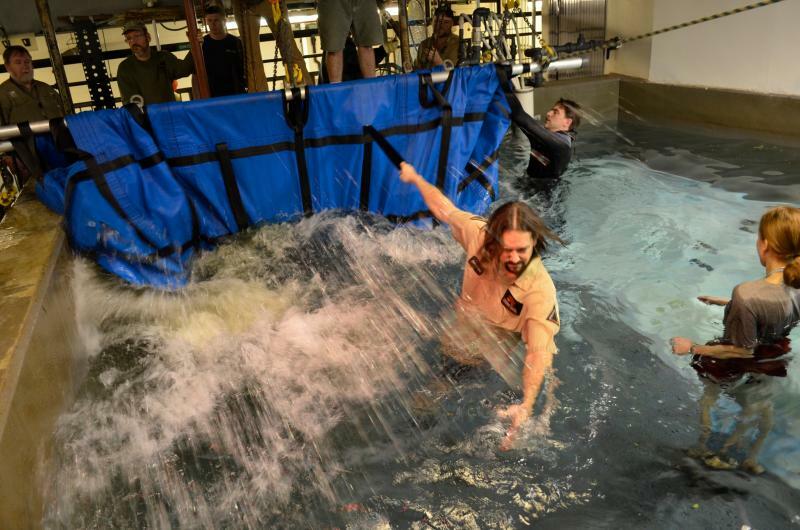 Fish & Wildlife Service's Manatee Rescue, Rehabilitation and Release Program. Wooten has been at the Cincinnati Zoo for the last two years. See a video of Wooten here. Last year another zoo manatee, Illusion, was released. The Cincinnati Zoo still has one manatee. Right now there are no plans for Betsy to leave.